Intensified patrol coverage resulted in a decline in illegal activity. This was not always the case. When the Akagera Management Company first took over the management of the park in 2010, an understaffed scout force and lack of resources posed a major challenge to the protection of the park. Law enforcement was overhauled in collaboration with our partners and the result was a greatly strengthened team under the leadership of a new head and deputy head of law enforcement. The efforts of our rangers resulted in a significant number of arrests and thousands of snares being removed during the years – both of which can be directly attributed to intensified patrol coverage and a more motivated team. In the following years, the number of arrests and snares collected declined, along with a significant drop in the number of animals poached, indicating that the intensified efforts have produced positive results. 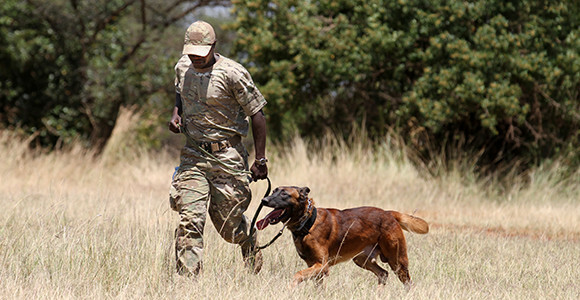 An anti-poaching K9 unit, funded by the Rwanda Development Board, joined Akagera’santi-poaching unit in 2015. Used to track and restrain poachers in the park, the dogs and their handlers are helping to keep poaching levels at an all time low in the park.